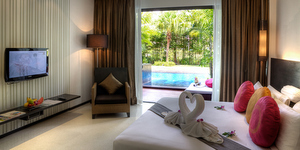 The Chill Resort and Spa is one of Koh Chang’s most luxurious 4 Star resorts. Located on the very popular Kai Bae Beach, The Chill Resort and Spa has 38 spacious rooms and suites over three floors set in pretty landscaped gardens, together with swimming pool, spa, restaurant and bars. Accommodation comprises a mixture of deluxe rooms on the second floor, splash access rooms on the ground floor which give instant access to the pool, jacuzzi suites on the third floor and separate pool villas, themselves over two floors. 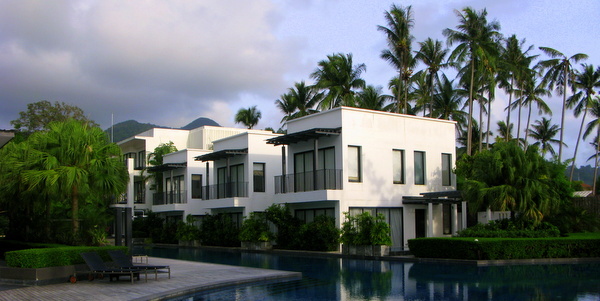 The Chill Resort’s magnificent feature swimming pool runs the full length of its buildings. You can step from the Splash rooms straight into the water or at the sea end, you can exit the pool out onto the beach. From there, you can walk to the northern cape or venture next door to The Awa or Gajapuri Resort. The sea will come right up to the front of the terrace at high tide and care should be taken swimming here, with rocks and coral underfoot. The amenities in The Chill Resort rooms themselves are everything you would expect of a luxurious resort with individually controlled air-conditioning, 40″ TV, DVD, Home theatre, tea and coffee making facilities, mini-bar, in-room safe, hairdryer, bathroom accessories and wifi. The Chill Resort offers an all day à la carte breakfast with no time restraints, so you can stay in bed all morning and still get served with no worries; it’s part of the room price in most deals. The Chill Out Cafe serves fusion Thai, Italian and International cuisine all day. There’s a sunset pool bar too, with a happy hour. The food and drink is universally praised by the guests but prices obviously befit a 4 star resort standing. As an alternative, you can easily venture out onto Kai Bae’s walking street for lots of further dining choices, with Ziva Italian, Moo 4 and O2 just some suggestions among many. Along the main road, you’ll also food stands, fruit markets, convenience stores and a few bars with Mojitos and The Wine Gallery both worth a stop. The Chill Resort runs a full Spa on site, with massage, steam room and treatments, open daily from 10.00am to 10.00pm. Their library has a Home Theatre, internet stations and books. Service and staff are very attentive and professional, with great attention to detail and an obvious desire to look after their guests. The Chill Resort exudes style, whether it be the building design which houses the chic rooms, its swimming pool or its spacious, light front reception. It may be a bit too cool, too Bangkok for some tastes but for us, it is exactly what a modern 2015 resort should be. With style comes a price, however, so expect to pay some of of Koh Chang’s top prices. In our opinion, The Chill Resort and Spa ranks in the top 3 of Koh Chang’s 4 Star Resorts. Infants up to 1 stay for free, though cots will be charged; children from 2 to 5 use an extra bed (charged) but can stay for free with existing bedding; over 5s are considered adults. Supplements extra.